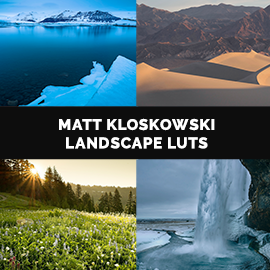 5 of Matt Kloskowski’s signature LUTs that he uses on all of his photos. LUTs for ON1 Photo RAW 2018.5, ON1 Photo RAW 2019, Lightroom, and More! Matt is a Photography mentor/coach that specializes in Outdoor/Landscape/Nature photography and editing with Photoshop, Lightroom and ON1 apps. Matt is also included as a Sony Artisan of Imagery, and author of over 15 books on post-processing (Lightroom & Photoshop) and photography. He calls himself a Landscape and outdoor photographer, because landscapes seems kinda limiting. He likes to shoot, teach about, and post-process just about everything that has to do with the outdoors and traveling.